Jon Stewart's The Daily Show sendoff has been epic so far, and seems to just be increasing in awesomeness as the very end grows closer and closer. (Come to think of it, that's probably just a tactic to make people forget how sad they are about Stewart leaving). And now, things are set to get even more awesome: On Tuesday, President Barack Obama is appearing The Daily Show for his final interview with Stewart on the series. I'm sure the appearance will include a ton of riffing between him and his old kinda-friend Stewart, and I can't wait. Stewart has forever changed the interplay between comedy and politics, as well as the landscape of late night television, and Obama's appearances on the series have contributed to that. In case you forgot, in fact, Obama has appeared on The Daily Show as a guest seven times — the first being way back in 2005 when he was just a freshman senator from Illinois promoting his book, "Dreams From My Father." Obama was way more fun on the show before he was elected president, because he was afforded more freedom and could therefore riff and joke with America's Satirist-in-Chief, but his interviews with Stewart when he's president are still great. Sigh. Look how young, unafraid, and un-gray he was back then! He riffs with Stewart via satellite, saying "the Democrats are feeling a little frisky now — politically speaking." Also, he brilliantly slammed Republicans on the Iraq War, saying, "if you get driven into a ditch, you should probably fire the driver." "We don't like to divulge our secrets," Obama said when Stewart asked him if he has kegs at his campaign rallies that bring out tons of young people. Less inclined to joke around now that he was in a crazy contentious race against Senator Hillary Clinton for the Democratic nomination, Obama was still take a joke during this appearance — and had a little fun himself from Pittsburgh via satellite. Once he secured the Democratic nomination — and weeks before the general election — Obama talked to Stewart from Sunrise, Florida. It's great not only for the jokes between Obama and Stewart, but also for when Obama talked about the time he bought airtime on major networks to talk about his campaign, and also assured Stewart it wasn't like the ShamWow infomercial. 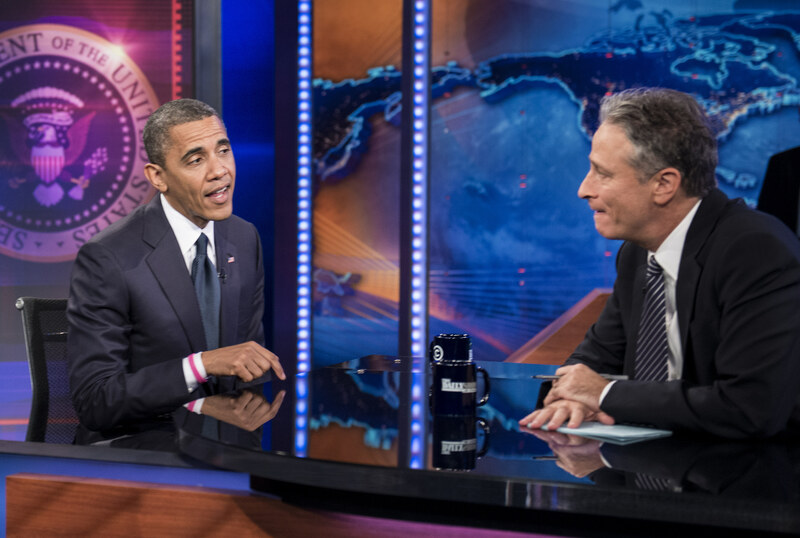 Obama's final appearance with Stewart on The Daily Show will air on Tuesday, July 21, at 11 p.m. ET.